For the past two weeks we’ve been asking for your Church Visitor Horror Stories. Yikes—scary stuff. We knew being a first-time visitor can be frightening, but we had no idea how horrifying your stories would be. Thanks for sharing your church visitor horror stories. We’ll post the three winners this week with some expert advice. 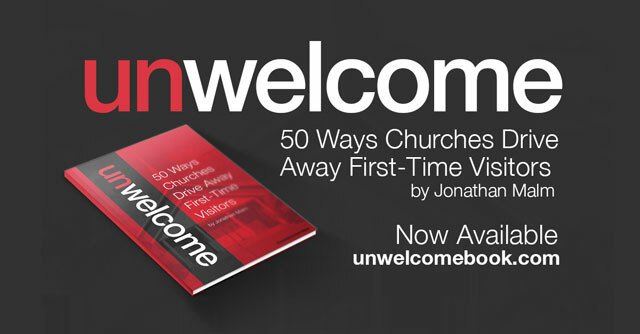 It’s all part of the launch festivities for our new book, Unwelcome: 50 Ways Churches Drive-Away First-Time Visitors. It’s on sale this week only, so grab a copy today. Without speaking or smiling, she nodded in the affirmative. Creepy. Nice job, Randy. Congrats! You’ll be getting a signed copy of Unwelcome. We talk in Unwelcome about reserved seating. Generally, you should never tell someone where they can’t sit. Instead, you should tell them where they can. Offer possibilities, not restrictions. Unfortunately, that doesn’t keep your congregation from reserving seats. And it doesn’t necessarily keep them from feeling ownership of their favorite pew. I see only two solutions to this horror story. There’s the direct approach, then there’s the sneaky approach. The direct approach to solving this problem is just addressing it head-on. Paint a picture of what you expect from your church. Let them know that growth causes slight discomfort. Growing pains. Ouch. Preach the truth! C’mon, saved seats? Are we in middle school? The reality is some church members have been sitting in their padded pew for far too long. They’ve forgotten the point of the gospel, that whole thing about bringing in the lost and then gathering together as a body of believers. Most everyone says they want their church to grow. But many don’t want to deal with the consequences of that growth. Change can be rough. So paint a picture of what you’re expecting (maybe a little gentler than what I said). Let your congregation know the consequences of that growth. But also let them know the consequences of not growing. Healthy bodies grow. If you aren’t bringing in new people, your church is in decline. It will eventually die with the current generation. The sneaky approach is to seat people proactively. Instead of simply hoping all your guests and congregation members find seats in your service, lead people to a seat as soon as they enter the worship center. Like ushers at a fancy performance. Instruct your ushers to beckon people toward the front and show people where to sit. Don’t force people to sit somewhere if they want to find their own seat. But most people are happy to be told where to sit. It gives them comfort to know they won’t have trouble sitting where the usher sat them. They won’t find themselves in a restricted row or in a section reserved for the choir. If you start implementing this, you might get initial pushback from some of your old-timers—the folks who have been attending for a while. But eventually it becomes a feature of your service instead of a nuisance. I recommend you do both. Confront those seat savers directly and also be sneaky with ushers. By casting vision for what you’re trying to accomplish, your congregation will more easily transition to the approach of proactively seating people. You’ll create a more inviting culture, which will trickle down into other areas as well. You’ll even find people giving up other comforts in service of reaching new people. And that’s what you really want: A genuinely welcoming congregation. One more scary story: The stalker. I was wondering I am a door steward at my church and there is a seat at the back for me to allow me to open the door for when the children are going to Sunday school. Lately this young man keeps sitting in the seat I have a sign on it saying reserved for door steward but he just sits on it. The church is normally full but it makes me feel like nope your not needed. Can you help me please. I’ve been doing the door for a number of years now but just the fact that it makes me feel like nope your not needed in here. I then tend to leave as that’s how I end up feeling that I’m not wanted. It’s Easter soon and I don’t have to work so I can stay for a whole service so I was wanting to try and get this sorted before then.